We all know and probably heard many times all the benefits of running or jogging. To name a few: running boots energy, controls weight, combats health conditions, improves mood, gives us better sleep, etc etc. But this time I am not gonna repeat what we know already very well. This time I am gonna talk about a hidden benefit of walking (at a pace) or running. Something that you might have experienced before but perhaps you never realized. And that is .... 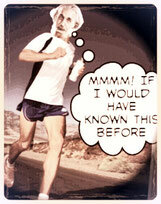 I know I am not alone when I say that I do some of my best thinking during a brisk walk or slow jog. When I am stressed out on a project, concerned about something going on in life, or just thinking too much, I find that my most creative and thoughtful ideas come while I am brisk walking. I don't know if you will believe it or not but many of my best ideas, even blog posts topics, came to my mind through this very productive time. Even the idea of making this blog came out actually during a brisk walk session. I prefer brisk walking better than running because I think the best thinking comes out of exhaustion, but I have experienced also this amazing momentum while running. And I have learned over the years to actually use walking at a pace or running as a tool for brainstorm myself or as a highly effective problem-solving technique. If I have my mind blocked with something and I have the option to disconnect by going a few kms far, I will often do. I remember doing this with my friends when i was a teenager. We used to talk while walking or running at low speed and it was more fruitful than just seating on a couch. Now I have made of this a habit and I personally take daily breaks to walk or run for half an hour or so. This helps me to get back on track and relieve my stress. It also gives me an opportunity to think quietly about any problems and find the appropriate solution. I have solved more problems while i was running than during any meeting or brainstorming session. But this is not all, walking or running also keeps me in shape both mentally and physically. During my walking (or running) sessions I try to leave all the things associated with work at the office, let's say I try to totally disconnect from the outside world and think about the things are really important to me. I totally reset my mind before I leave, turn off my cell phone and I go completely off-mode. Then, the brainstorming will come up as soon as I am walking or running for a few mins. I take mental note and try to memorize everything, like a "to do list", out of my own brainstorming. Alternatively, I can use my best friend to take notes. When I get back to my home or office, I am completely refreshed and ready to jump back into my normal life with my "to do list" ready, problems solved, and, at the same time, I am more productive and efficient because of my stress-releasing break. This way I can stay calm and positive under pressure and meet new challenges eagerly. Walking or running break times are very important for my work and home balance, and I have already made it part of my life. It has become a tool not just for fitness and health, but mostly for mental rejuvenation, problem solving, stimulating & brainstorming, and regenerating myself. There are other examples of this even for the business world. Brainstorming is a well-known idea generation technique, which plays an important role in business development processes. There are some studies comparing between two brainstorming sessions, one performed during a walk and the other traditionally in a room, showing that brainstorming while walking can encourage team members to participate in and contribute to the session in an equal manner and it can help a team to maintain sustainable mental energy. Some companies encourage small group of people to walk during meeting sessions to fluid creativity. This helps people just spit out ideas and continue the conversation. Sitting encourages people to say what they need to say and be done, while standing and walking allows people to be more free and give their new ideas. "I do not know if you will believe it or not but when I go out running or brisk walking my brain starts generating ideas or giving me solutions to any problems or worries coming to my mind. Sometimes ideas and solutions come so quick that I do not even have time to keep mental notes or communicate it to "my best friend". It even gives me quick solutions to problems or situations that have been running and stuck in my mind forever". But is there any science behind this idea that running makes better brainstorming? In fact there is because during exercise blood pressure and flow increase, sending more energy and oxygen to the muscles and organs. That includes oxygenating our brain resulting in a better brain performance. But there is more ...... There is some scientific evidence that we are actually thinking, learning and remembering better due to high hippocampus activity during exercise, the hippocampus being a part of the brain critical for learning and memory. Also neuron activity makes our cognitive function to improve. Studies in mice have revealed that running enhances spatial learning. Other recent work indicates that aerobic exercise can actually reverse hippocampal shrinkage, which occurs naturally with age, and consequently boost memory in older adults. Yet another study found that students who exercise perform better on tests than their less athletic peers. Why I think all the above makes sense? well, not only because some studies have demonstrated so but rather because I experience it regularly. But brainstorming is not the only thing I experience during these sessions. I also experience other effects during- or right after-brisk walking or running that I am not sure if science can explain. For example, the feeling of getting lost in thoughts, removing myself totally from distractions, the loneliness feeling that comes during this solo sessions, the calming effects of deep breathing and heart beating ... These are other of my favourite feelings, and it is also responsible for keeping me fit & healthy. What better reasons you need? Have you tried already and no results? Perhaps you pushed yourself too much to get quick results. Brainstorming should come normally and ideally under relaxing situations. Give it another chance!